President of the Republic of Azerbaijan Ilham Aliyev has visited the embassy of the United States of America to offer condolences over the death of the 41st President of the United States, an outstanding statesman George Herbert Walker Bush. 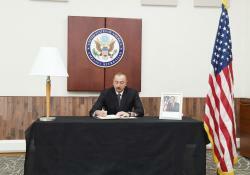 The president signed a book of condolences. 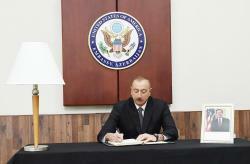 President Aliyev then spoke with the US Charge d'Affaires in Azerbaijan William Gill. 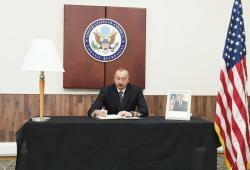 President Aliyev described George Bush as a prominent statesman and recalled his memories of the former US president.